The top US nuclear envoy said Friday that successful cooperation between South Korea and the US will help bring an end to “war and hostility” on the Korean Peninsula, while adding that the US was excited to hear the results of the two Koreas’ joint railway survey. 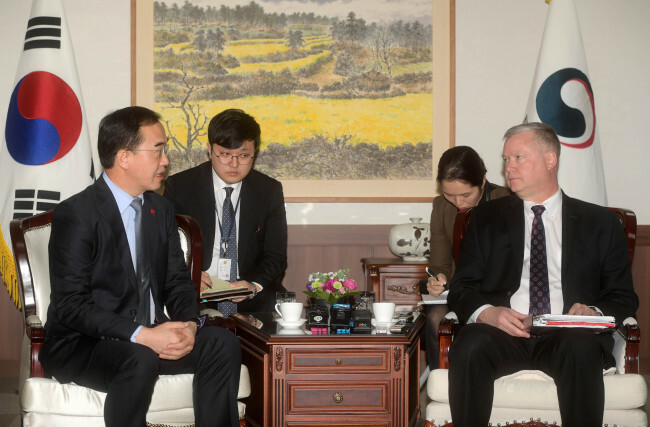 “The work we do together is not just for US-South Korea relations, it’s for the future of the Korean Peninsula,” Stephen Biegun said during a meeting with South Korean Unification Minister Cho Myoung-gyon in Seoul. “And if we are successful, we will close a chapter of 70 years of war and hostility on the Korean Peninsula and create a new, brighter future for all of the Korean people,” he added. Biegun’s Seoul trip comes amid a stall in US-North Korea denuclearization talks, with the two seemingly unable to reach a consensus on the concessions they would or could make at the negotiation table. The main purpose of the trip is to hold a second working-group meeting with South Korean officials handling North Korean affairs. Cho noted the frequency of his meetings with Biegun as of late and interpreted this as the allies’ efforts to steer the denuclearization issue and inter-Korean relations in the “right direction.” He also mentioned his meeting with US Secretary of State Mike Pompeo last month in Washington, saying it had been a good opportunity that had strengthened cooperation and brought about better understanding between the allies. The minister also mentioned the allies’ working group, which was officially launched last month, and thanked Biegun for his efforts, saying they had produced “fruitful results.” The working group was formed on the back of US concerns that the speed of development in inter-Korean relations wasn’t in step with progress in US-North Korea denuclearization talks, analysts have said. The lack of progress in the talks has created obstacles to the full materialization of a slew of inter-Korean cooperation projects, including the modernization and reconnection of cross-border railways and roads on the peninsula. Seoul and Pyongyang are currently preparing to hold a groundbreaking ceremony for the joint project at Panmun Station in Kaesong on Wednesday. Upon his arrival in the South on Wednesday, when asked about the slight change in tone on North Korea revealed in the remarks on humanitarian aid to the communist state, Biegun had replied, “We’re keeping the door open for peace.” The subject will be discussed with the South’s Foreign Ministry, he’d added. Biegun on Wednesday also said that early next year the US will “re-evaluate” its ban on American citizens traveling to North Korea to facilitate aid groups’ work of providing humanitarian assistance to the North. Lee Eugene, the Unification Ministry’s deputy spokeswoman, told reporters later that the Seoul government had been in discussions with global aid agencies toward the resumption of its long-suspended $8 million humanitarian assistance plan for the North. It will be provided to the North via global agencies at an “appropriate time,” she added.